Random Pixels Blog: Millionaire populist Philip Levine is 'so happy' he's Miami Beach mayor! Millionaire populist Philip Levine is 'so happy' he's Miami Beach mayor! There's an interview with Miami Beach Mayor Philip Levine in the October/November 2014 issue of Worth magazine. If you've never heard of Worth, that's okay, I haven't either. Levine is getting ready to mark one year in office. But in that year, he's never given an in-depth interview to the Miami Herald, a newspaper he despises. On the other hand Levine has no problem asking the Herald to print his op-ed pieces. He likes getting his message out minus the annoyance of a reporter asking a lot of pesky questions, so the Herald's op-ed page is perfect for him. In other words, he's a hypocrite. Levine also likes to reach his constituents on platforms that he can control completely: Facebook, Twitter, etc. Leave a comment he doesn't like and you get blocked. So when Worth magazine contacted him for an interview, Levine was more than happy to cooperate. Because, as you'll see below, there weren't that many tough questions. But aside from that, the interview is both intriguing and revealing. Levine opens up to writer Richard Bradley in a way he hasn't with the Herald or any South Florida reporters. Below are some of the Bradley's questions and Levine's answers...along with some analysis - in blue - by yours truly. Introduction: Five years ago, Worth profiled Miami Beach businessman Philip Levine, who had stumbled into a job giving talks to cruise ship tourists and parlayed that into a company called Onboard Media, which created content—everything from magazines to in-cabin TV programming—for cruise lines. In 2000, Levine sold Onboard to Louis Vuitton Moët Hennessy for a reported nine-figure sum. He lived well, invested in some real estate and acquired a reputation for dating models. The question our profile asked: What would Philip Levine do for his second act? It took a while, but last year we finally found out: Levine ran for mayor of Miami Beach. Decrying the incompetence and cronyism of local government, Levine, who had never run for political office before, spent $2 million in his quest to govern a city of 90,000. 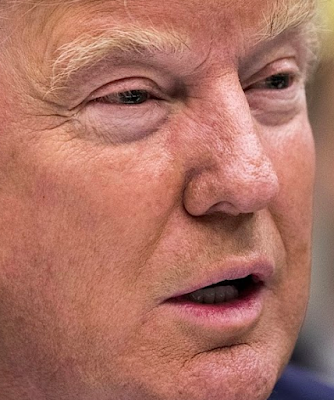 In November 2013 he won with just over 50 percent of the vote. Actually, he squeaked by with 50.48% of the votes cast...hardly a mandate. Worth: So if the business is fun and profitable, why run for mayor? Levine: I just always thought it’d be something I’d like to do when the time was right for me. And then, of course, I have a tremendous friendship with former President Clinton. Being around him and around world leaders, and seeing all the good that he’s done with the Clinton Global Initiative, everything else that he’s done in his life…. Worth: What I was really driving at was the personal life aspect of running for office. You’re a single guy with a reputation for dating beautiful women. Did that give you pause? Levine: I’m not married, so for me, it’s not an issue. I don’t have a criminal record. I’ve got a great credit history. A mayor who dates beautiful models, who is not a criminal, and who has a great credit history. What's not to like? Worth: Other than Clinton, were any politicians a model for you? Levine: [Former New York mayor] Michael Bloomberg. If I could be 10 percent as good as him, I’d be very happy. He’ll go down, in my opinion, as one of the greatest American mayors. Name dropping again. But he forgot to mention Winston Churchill, John Kennedy and Ronald Reagan. Worth: Who were your opponents? Levine: I was running against a gay Hispanic commissioner named Michael Góngora, who was my main opponent. A comedian named Steve Berke. And an Israeli gentleman who’s very unique. A prominent Miami Beach resident emailed me this observation: "I HATE to be politically correct but his description of Michael Gongora is...offensive to me. Would he have said 'a black commissioner?' Or 'a white commissioner?' Come on." Worth: Was there a watershed moment for you in making the decision? Levine: I was so sick and tired of seeing people run for office or people in office who have two characteristics. Number one, they’ve never been successful at anything in their lives. Number two, they want to run for office to help themselves. These are both horrible characteristics. Interesting. So if we're to believe Levine, he spent $2 million of his own money to get a job that pays $10,000 a year...and he doesn't want to help himself? He wants nothing in return? Really? 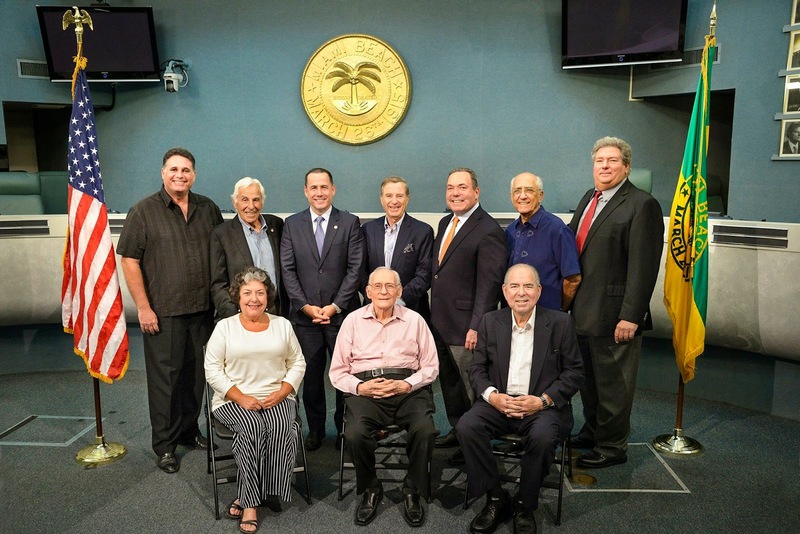 Also, Levine recently hosted a reunion of former Miami Beach mayors. According to Levine, they all ran for office because they'd "never been successful at anything in their lives and wanted to help themselves." of former Miami Beach mayors who, according to him, had "never been successful at anything in their lives," until they ran for office. Worth: How long does it take to knock on 6,000 doors? Levine: It took me about seven months. I went through cans of suntan protection spray. What in the hell is "suntan protection spray?" Worth: You didn’t get a lot of union support during the campaign. Why not? Levine: I knew I was getting no endorsements. What’s amazing about unions and media is, they love the status quo. The police union supported my opponent. The fire union supported my opponent. The AFL-CIO supported my opponent. 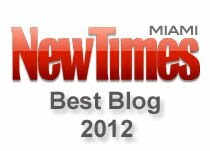 The Miami Herald couldn’t have been more against me. Worth: How do you explain that? Levine: Failing businesses usually fail from the top. I used to laugh and say that when I started my new business, I made more money in my first year than the Miami Herald made in the last 10. But their editorial board was aggressively against me. They saw a rich guy. Worth: You got Bill Clinton’s endorsement, though. Levine: Two weeks before the election, President Clinton came down and did a press conference with me. The Herald was like, “Are you sure it’s President Clinton?” (Laughs.) These are fakakta companies. 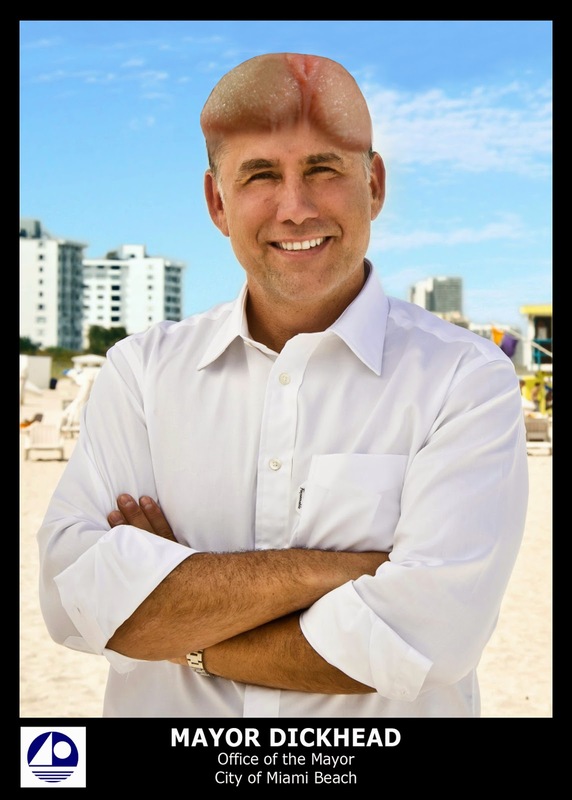 There's a reason why I call Levine, Mayor Dickhead. He's earned the name. In three questions, he manages to diss the Miami Herald, not once, but twice. Good luck in getting the Herald to print your next cheesy, blowhard op-ed, Mayor Dickhead. Worth: You’re taking on some forces that have more tangible structural power than the office of mayor here does. Levine: Well, that’s the beauty of being a Bloomberg-esque type mayor. You're name dropping again, Mayor Dickhead. Worth: Policy goals aside, are you enjoying the job? Are you having fun? Levine: I love every minute. Worth: Every minute? There’s nothing about this that you don’t like? Levine: I wake up every morning and I’m so happy I’m mayor.